q: Where did you get my account expiration date from? It is not listed anywhere in my account profile. q: I would like to know if someone else logs into to my AwardWallet account, is there a way to do that? q: Can I automatically show all the items from my AwardWallet trips timeline on my calendar? q: I need to crunch some numbers, can I just get a dump of all my AwardWallet account data into an Excel file? q: I update my AwardWallet accounts from different devices, like my phone, and from my computer, can I see a report of all of the accounts that changed the balance in the last week or month? q: I am earning miles for a specific trip, can I set a goal inside AwardWallet to track progress toward my goal? q: I have too many accounts in my profile, how can I organize the most popular accounts into a separate view that I can use on regular basis? q: I have too many loyalty accounts, so when I come to AwardWallet I do not wish to update all of them, I just want to update the ones that have not been updated in more than a week or a month, can I do that? q: I noticed that AwardWallet updates some of my accounts in the background but I have no idea when that happens. Is there a way for me to better understand that process? q: How do I make sure I don't miss out on some promotions that are out there? q: How do I know what elite status I have on each account and view my progress to the next elite level? q: I have some companion ticket certificates, travel vouchers, and gift cards, can I track all this stuff alongside my AwardWallet accounts? 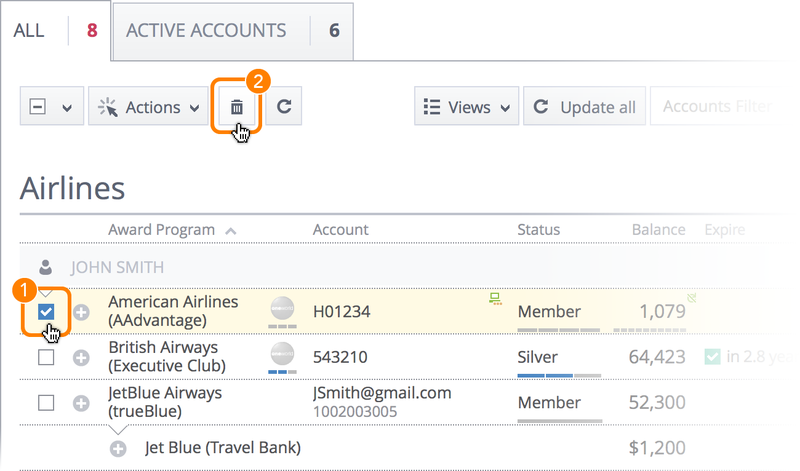 q: I use AwardWallet primarily to track my travel-related loyalty accounts, such as airline and hotel loyalty programs. What about retail programs? Can AwardWallet track those balances and expirations too? q: I just updated a bunch of accounts and closed the browser. I would like to know which accounts changed and what was the change, can I still do that? q: I just deleted a trip segment from my travel timeline. Is there an easy way to undo this? q: You guys are just putting my flights and hotel stays on my timeline without organizing them, can I group them into separate trips? q: Some of my accounts are not updating and are marked with a yellow bar (to the left of the account), what's up with that? q: I see a "Credit Card Spend Analysis" link in my account list, what does it do? 1. Are you maximizing your earning? 2. Could you earn more, and how?